Do you know that half of the world’s people are still experiencing a medieval level of sanitation? They do not have access to a decent toilet, in fact, many of them have to do their business on the bare ground. 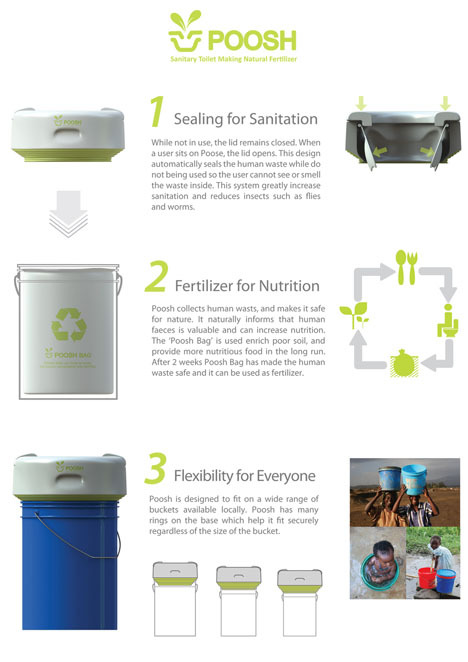 POOSH is a bucket mounted toilet solution for the developing world which comprises a complete waste management system with a sanitary, low smell, easy to use toilet seat that works with a wide range of common bucket sizes. Designed by Mark Whiting, this portable toilet seat automatically opens when in use and closes again when the user is finished, greatly reducing smell and significant health risks like flies and maggots, common in open latrines. 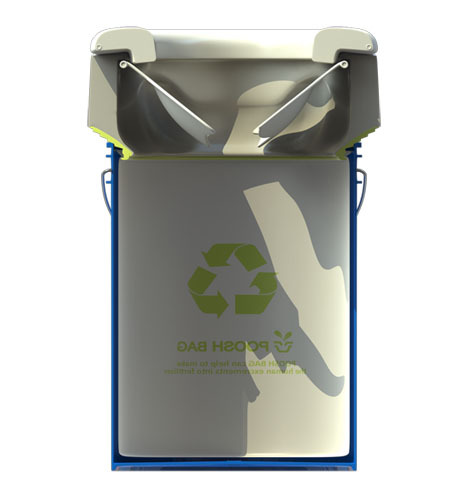 The system incorporates a bio-plastic self sealing bag which introduces chemicals to the waste, catalyzing the conversion into fertilizer as it biodegrades, making it safe to be used to enrich crops. 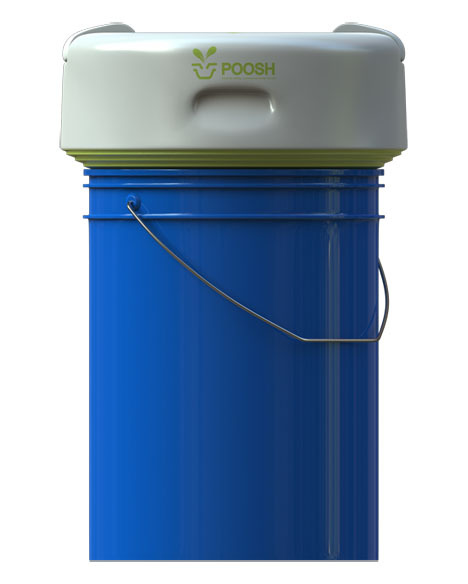 POOSH is a waste management solution designed to reduce significant causes of death and disease in the developing world. 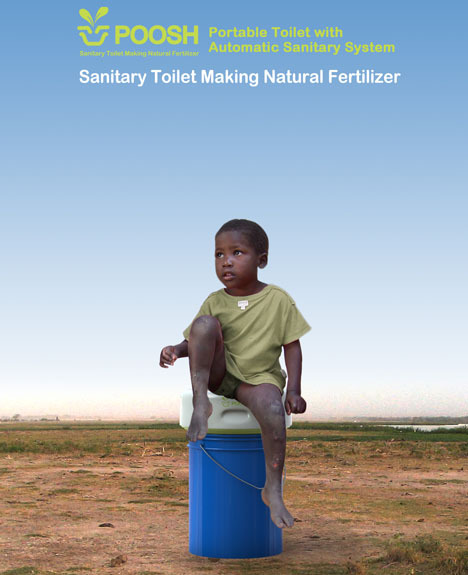 It is a product and system designed particularly to reduce water and food contamination, due to exposure to faeces, and related malnutrition killing more than 10,000 children EACH DAY in developing nations. 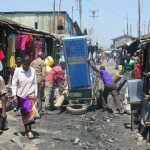 In this context many people do not have access to adequate latrines. The systems in place are often simply pit toilets or areas near rivers where trash has collected. Users of such systems are exposed to maggots, bacteria and many parasites which can cause many diseases including cholera, typhoid fever and Polio. During the rainy season pit toilets also flood, further contaminating local water supplies and crops. Human waste in its raw form is not safe to be used to grow crops, however, after a lengthy decomposition process it becomes a good fertiliser. 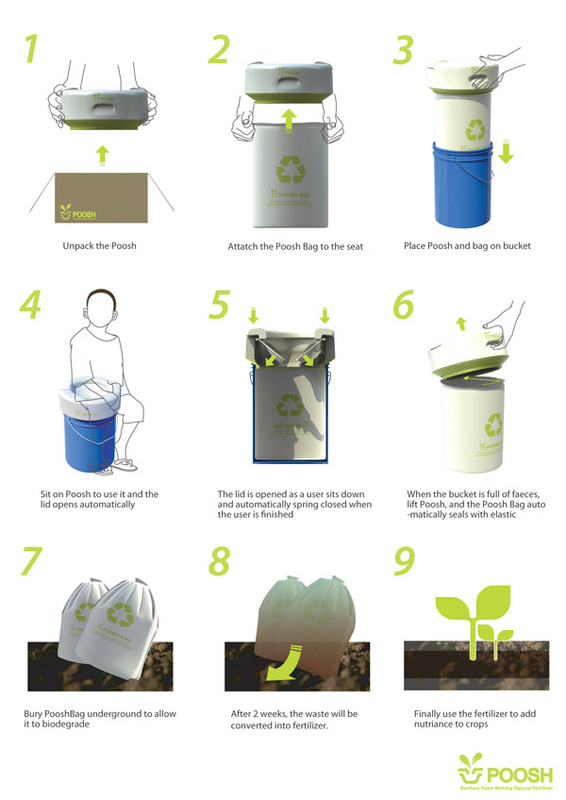 POOSH is a simple system involving a toilet seat and a specially designed biodegradable bag which can be used with a wide variety of common bucket sizes. 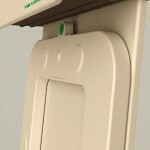 The seat automatically seals except while in use minimising the oder and significantly reducing the number of flies and human exposure to faeces. The bag is made of a biodegradable bio-plastic and includes some chemicals the speed up the decomposition of human waste, the result being, after about 2 weeks, one bag of waste will have transformed into a mound of rich fertiliser which can be used to add nutrients to crops. 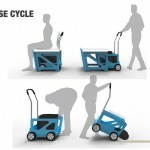 The bag fits over a lip on the bottom of the seat and automatically seals when the bag is full and the seat is removed. POOSH has been designed to provide a viable, sustainable, infrastructure free waste management system where, in many cases, there is no system at all. 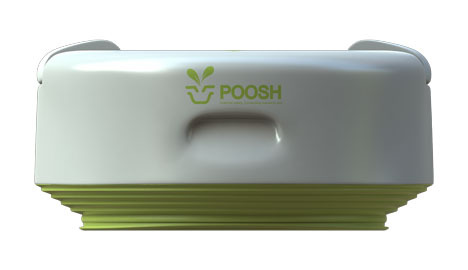 POOSH is constructed from Post Consumer Material (recycled water bottles), rubber, and bio-plastic with a simple, easy to clean, design with no cavities which could collect waste and harvest germs. The seat features a rubber resting surface so it will sit soundly and securely on a wide variety of buckets, including the common 5 gallon bucket standard. The POOSH system is designed to be very easy to implement and use, and precautions have been made to avoid unsanitary misuse. 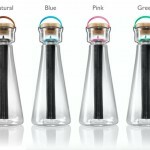 The POOSH bag is made of a cheap single layer bio-polymer and is intended to be locally produced to reduce costs. 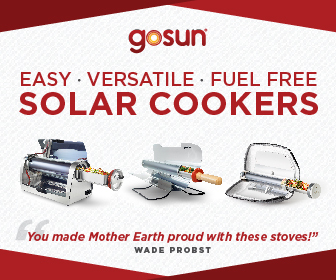 The implications of POOSH for the developing world are numerous. By reducing the contamination of water supplies near civilisations, water collection times and disease from bad water will be minimised. Similarly, by diminishing the exposure to human waste and sealing it safely from flies and animals, many other diseases can be alleviated. By improving water quality and providing a constant near free nutrient rich supply of fertiliser local agriculture can flourish and, malnutrition, one of the largest causes of child mortality in the developing world, can also be substantially reduced. The result being less death and disease and greater possibility for agriculture, education and development. 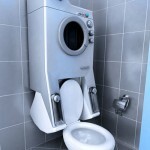 This entry was posted in Bathroom, Designs and Concepts, Domestic Aid, Green. Tagged as food contamination, pit toilets, portable toilet, sanitary system, toilet solution, typhoid fever, waste management solution, waste management system. But you need something to wipe with right? I am fully aware that there are numbers of people who are still suffering from medieval sanitation. Hence, this portable toilet would really be helpful in remote communities as it gives the locale more convenience and proper sanitation.